Our first court date was as ludicrous as a boda boda trying to carry my husband up a hill. David flew from America with our oldest son, 7-year-old Jacob, to join me and our two younger sons, as well as the almost-two-year-old daughter we were in process to adopt; and we flew with our four kids from Nairobi to Kisumu. 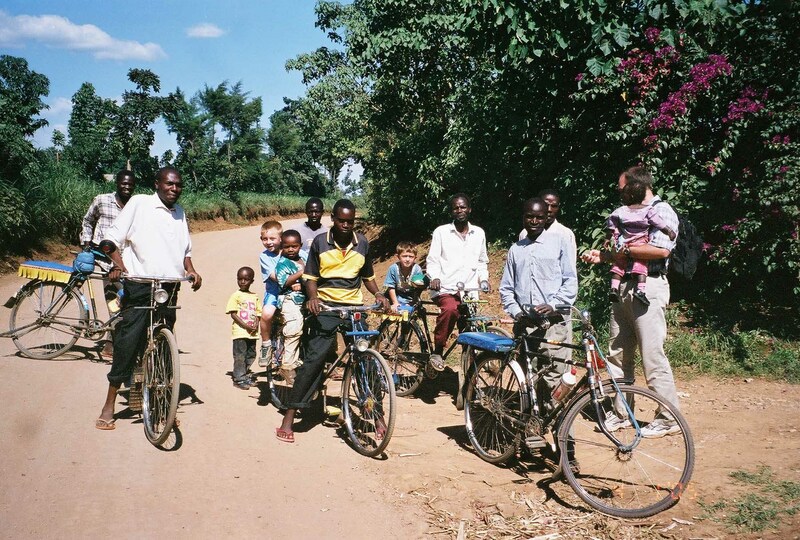 In the nearby rural town of Kakamega, the easiest and most economical way to get around is on the cushioned backseat of a bicycle, holding on tight and keeping your feet from dragging. David likes to joke that he is a boda-boda rider’s worst nightmare. Certainly it was true when we hit that long incline winding up through tropical green. Eyebrows furrowed and panting heavily, the small wiry Kenyan strained to pull his 6’2” cargo. Relief flooded the man’s face when David offered to get off and walk. 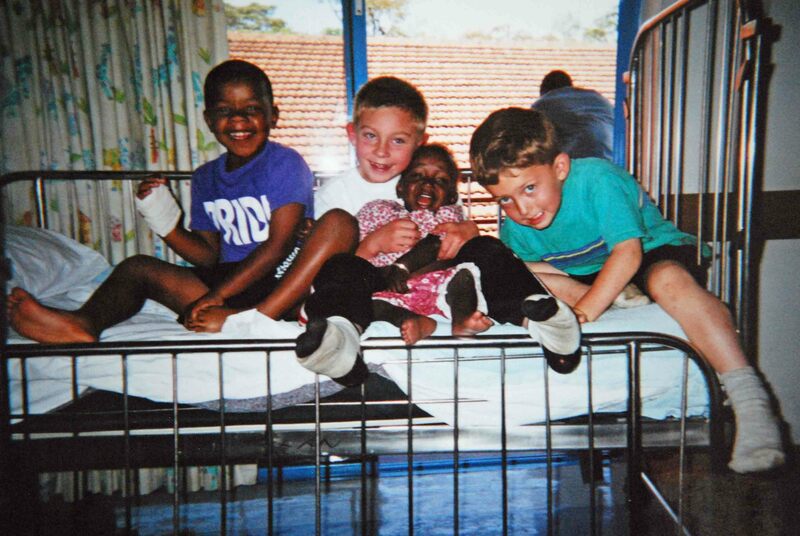 Hospital reunion – Jedd was obviously feeling better! Perhaps the circumstances of David’s and Jacob’s arrival in Kenya were an omen. The day they left Colorado, Jedd spiked a high fever. 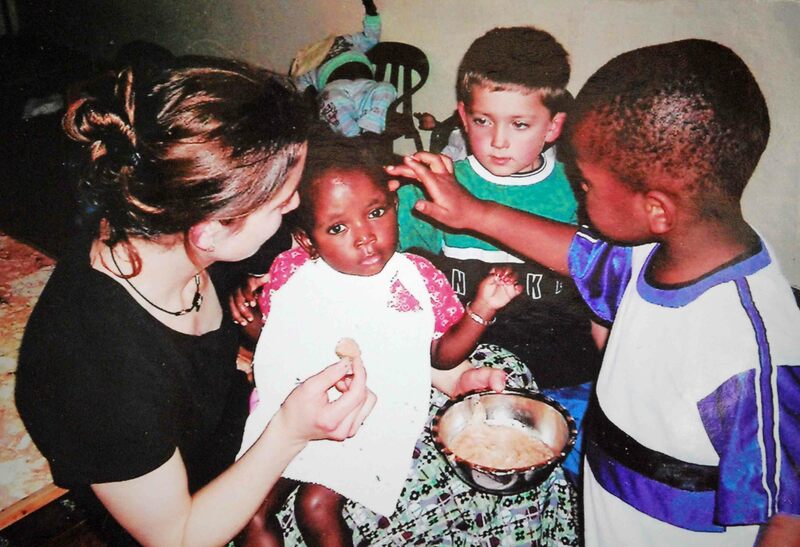 (Jedd’s 2001 adoption from Kenya is described in Flame of Hope.) I called a driver, a tremor in my voice. We raced to the hospital where Jedd was admitted and diagnosed with acute bronchitis. The three kids and I spent a restless night tucked into one chair and two metal cribs. With no way to notify David and Jacob until they set foot in Nairobi, a driver informed them at the airport that our long-awaited rendezvous would take place in a hospital room. I arrived in Kenya two months prior, in late January 2005, with my mom, my father-in-law, and two of our sons, then four-years-old. This inter-generational rescue team stumbled into the train wreck of our first legal process after we discovered upon arrival that our first lawyer had completely disappeared, with full payment. Simultaneously, I began to hear rumors that judges in Nairobi were no longer granting guardianship to foreigners, a legal process that allowed adoptive parents to shorten their physical presence in Kenya from 7-12 months (inconceivable to our family) to 6-8 weeks. Maybe, people said, the rural courts would still permit guardianship. Through connections, we located a lawyer in Kakamega who had successfully completed an American guardianship case in the previous six months. 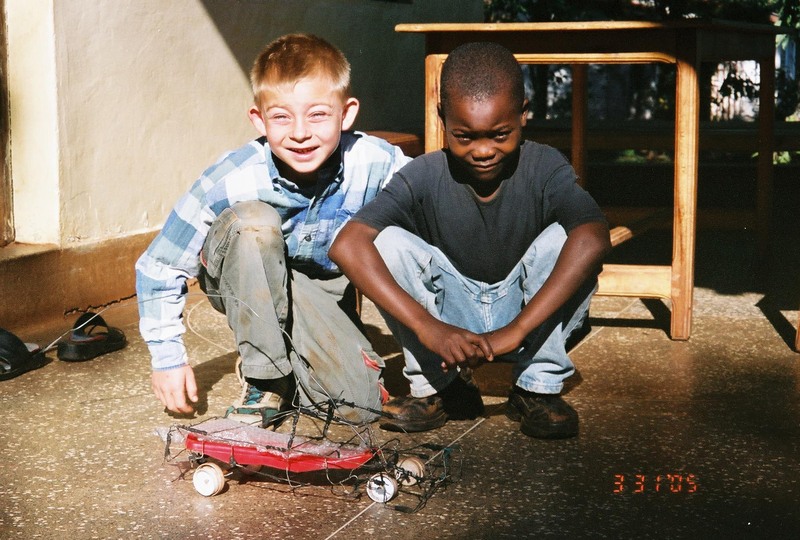 Jacob with a new friend and a “galimoto” – a toy made of wire & other found objects. So we found ourselves in Western Kenya in late March, harbored by new friends at an orphanage for 30 kids, nervously anticipating our day in court. After slipping from mosquito nets and eating our breakfast cooked over an open fire, we decked out in Sunday best. We walked to the courthouse, four white Americans with two black kids and a couple Kenyans, decidedly not blending in. David disappeared into the simple courthouse building with the lawyer while the rest of us waited outside. Hour after hour slipped by as I struggled to keep four little kids busy, quiet, and clean in red African dust. Curious eyes all around locked in on our every move. I had no idea what was transpiring inside. As the heat of afternoon wrapped its tentacles around us like the dread squeezing my heart, David and the lawyer emerged. Throughout the long day, the judge never called our case. David reported that though he perched on a wooden bench in the middle of the room, the judge very deliberately avoided looking at him throughout the proceedings. When the lawyer met with the judge after the day was dismissed, he said he would issue his decision without hearing our case. Helpless rage settled deep in my bones, beyond where tears could reach, as we walked the weary dirt road away from the courthouse. What could we do but return to Nairobi? David and Jacob departed for the US, leaving the younger kids and I weeping in a cloud of dust kicked up by the vehicle taking them to the airport. Repeated entreaties to Kakamega only brought reports that the judge continued to delay his verdict. Maybe he waited for a bribe, or maybe Nairobi-murmurs about new interpretations of adoption laws finally dissuaded him from deciding in our favor. The ponderous gavel of denial crushed our hearts a full month later, in late April. I crawled under my mosquito net that night, longing only to be swallowed in sleep-oblivion. But fear tangled my mind like the rattle of rats pilfering through our plastic-bagged-food. A child whimpered, and the oozing of my own tears threatened to suffocate me. For every prayer uttered over the last several months, the answer seemed to arrive upside down. Through that long night, I clung to a barely discernable whisper somewhere deep in my heart, “Fear not, for I am with you.” Isaiah 41:10. It was a time to dig deep. A time to believe that there was something happening beyond what we could see, a time to endure the “removal of what is shaken so that what cannot be shaken may remain.” Hebrews 12:27. It was time to discover that though I could lose my money, dignity, family members’ presence, strength, peace of mind, home, and even one of my children if Lily’s adoption should fail, that though “my flesh and heart may fail, God is the strength of my heart and my portion forever.” Psalm 73:26. Three arduous months twisted by between the first and second court dates, a journey of harrowing switchbacks. (Carried describes a particularly difficult moment.) The loving-kindness of family and friends in the US and Kenyan friends, including our third lawyer Mwenda, carried us through somehow until the next court date, our third legal process, on July 29. David and Jacob once again traveled to Kenya. This time, Mwenda assured us we were fulfilling every last dot and cross of the interpretation of the law for a full adoption on Kenyan soil. 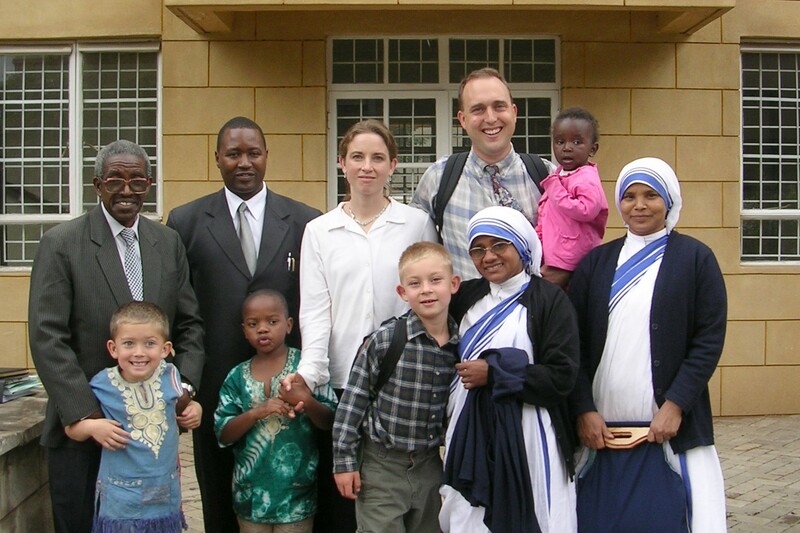 Our family of six threaded through chaotic Nairobi streets with Dave’s mom, Mwenda, Kenyan friends Pastor Karau and Michael, and Sr. Cletty, Sister Superior of Lily’s former Mother Teresa orphanage. Once in the somber halls of the stately courthouse crowded with waiting, whispering people, every noise echoed from cement floors and walls. Keeping the kids quiet and entertained kept every adult challenged. Finally, after two-and-a-half hours, the judge called us into her chambers. Racked with anxiety, hoping to make a good impression, I held Lily as she fussed, weary of all this waiting. I remember little of the proceedings except for a question asked of the boys by the judge, “Do you want to have a little sister?” Jacob piped up boldly, confused, glancing at Lily, “We already have one.” Laughter rippled through the room, at last dispelling the terrible tension. “The fight is over, she will not deny us,” Mwenda encouraged as we left. Still, despite our hopes and prayers for a verdict that day, the judge delayed her decision for another week, a date after David’s scheduled return to the US. Only Mwenda and I stepped foot in the courthouse’s deserted hallways for our third and final court date on the last day before an extended recess. As Mwenda disappeared to conduct other business, I settled alone on a bench outside the judge’s chambers. Only a week previously, so many had anxiously waited with me. I sank into the ancient words of the Psalms, “This I know, that God is for me.” Psalm 56:9. The roots of my soul gripped bedrock peace and assurance. Though I still trembled as I entered the judge’s room, I knew I was not alone. When the judge read aloud her verdict that at long last the legal system acknowledged what I had always known to be true, that Lily was mine, quiet tears streamed down my face. With the scrawl of a signature, a child’s official identity transformed from abandoned to claimed. It was a moment that surely should have been marked with fireworks, memorialized with battle cries of victory. But instead, Mwenda and I simply stepped out of the room side-by-side in a sacred silence. Was the greatest miracle the adoption finally granted, or was it the journey of my own heart? Though I pleaded time and again for external miracles, actions that God was surely more than capable of, time after time He answered with the opposite. As external storms battered my soul, God called me deeper and deeper, beyond what can be shaken. He tenderly led me deep into the unrelenting goodness of what He has always known to be true, that I am His. And that is enough. 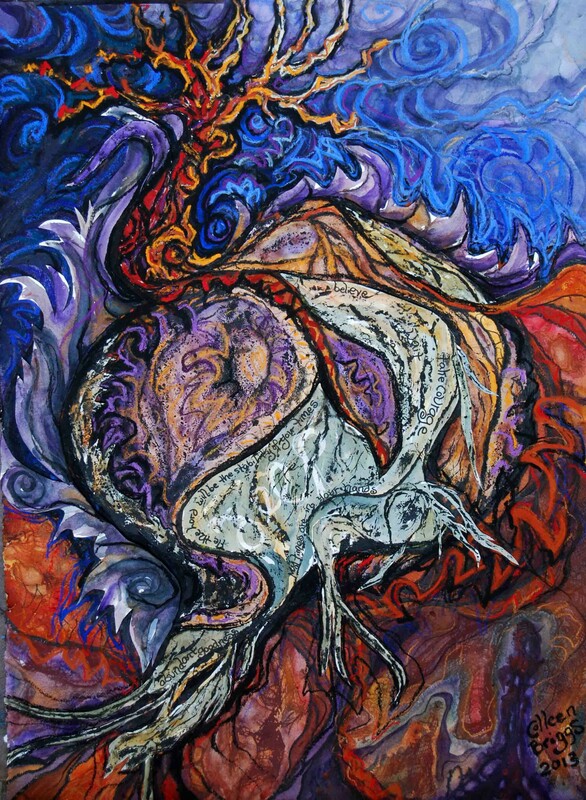 Go Deep; 2013; 18 1/2″ x 24 1/2″; mixed media collage: pastel, oil pastel, watercolor, collagraph, and ink.